More room and more space. For yourself, for your kids, for your family. Choose a loft or a suspended bed and get more space at home. 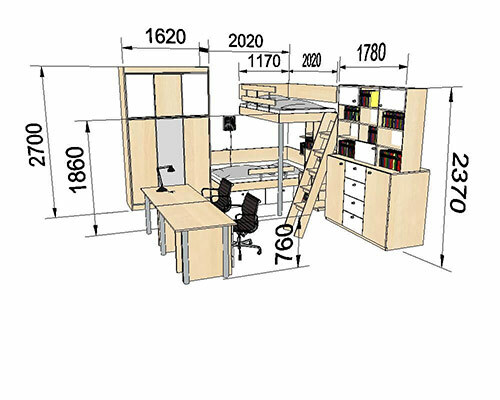 Convert your room into a bedroom with a closet, home office or add a relax zone. Choose your own dimensions, single bed or double bed. Select the size of an extra storage space. Mid-high beds provide you with a range of storage options. And the elevation of the bed will give you more comfort when going to bed or while getting up. Would you like to use your space at home more effectively? You have got your own ideas but you can’t find the furniture that fits? Would you like to redesign your home to create more room and more space for yourself, for your kids and the family? Let’s walk together through your plans and ideas. We will prepare some drafts and then make the most suitable loft or mid-high bed for you. You will finally get a new space you have always wanted. Enjoy your bigger home. What’s the best way to maximize your living space? The CASTER DESIGN company has been dealing with that question since 1999. We are here to introduce you a range of original and simple yet efficient furniture. You can choose from a variety of loft beds, high beds and mid-high beds. Find your best fit and have your living space been set up thoughtfully and in an elegant way. You will get an extra storage and more living space for yourself. Always keeping your budget in mind, we created an online shop to be in direct touch with you. You can choose from a wide range of quality products that you will not find in large furniture stores. Check our e-shop and pick a loft, high or suspended bed you like the most. Make your own configuration online and specify any modifications you want us to add to your project. Everything is custom made, straight from the manufacturer. From us directly to you.